Powder Coated Tubular Steel Fences. Panels with top rail heights of 4 ft, 5 ft & 6 ft nominal. Rails are 93" actual length, and form an 8 ft section with posts. These panels are able to slope (rack) 24 inches. These can also be cut to fit various openings. Rail brackets can be mounted on any surface such as wood and concrete or masonry with appropriate screws. Screws included are for steel posts. Steel Posts shown are purchased separately. 8 FT WIDE PANELS REQUIRE FEWER POSTS, LOWERS INSTALLATION COST - GREAT VALUE ! COMPLETELY MAINTENANCE FREE, NO WELDING, NO PAINTING! EASY BRACKETED DIY SYSTEM ! 1 set of Panel Brackets are included. EXTRA BRACKETS CAN BE PURCHASED SEPARATELY BELOW. Powder Coated Tubular Steel Fences. Panels with top rail heights of 4 ft, 5 ft & 6 ft nominal. Rails are 93" actual length, and form an 8 ft section with posts. These panels are able to slope (rack) 24 inches. These can also be cut to fit various openings. Rail brackets can be mounted on any surface such as wood and concrete or masonory with appropriate screws. Screws included are for steel posts. 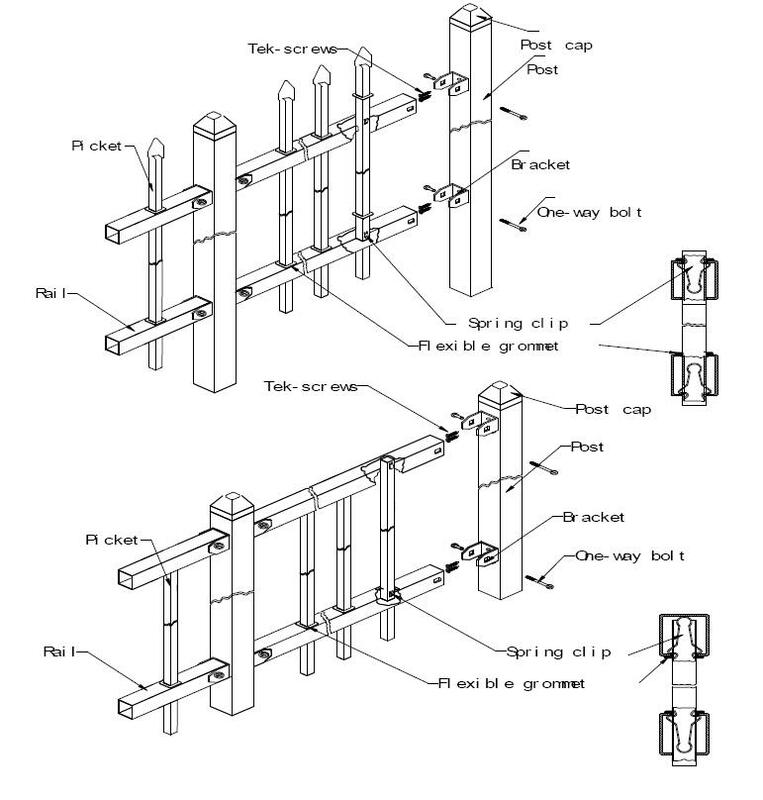 Steel Posts shown are purchased separately.